Overcoming the baby's difficulty sleeping becomes the main agenda for parents who have new children. The condition of getting up repeatedly in the middle of the night in order to persuade the baby to go back to sleep while taking turns with the husband is not something fun. Did you know, that sleep deprivation in babies is very influential on children's growth and development and brain development. Ideally, a newborn baby up to about 3 months old, will spend about 15-17 hours sleep. While children aged 6 - 23 months need about 13 hours of sleep each day. Baby sleep time that turns 1800 with adults is often a problem for babies having difficulty sleeping. Therefore, you need to teach your baby the difference between day and night. 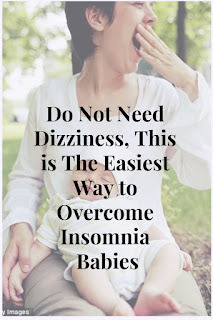 The way is to make the atmosphere dim or dim at night, as one sign that is easily recognizable by the baby as a time to sleep. During the day, open the curtains and windows so that the sun goes into the room. Besides being able to create a bright atmosphere, sunlight also kills germs and reduces the humidity of the room. In order for the baby to sleep well, you can create a comfortable and quiet room. Starting from soft lighting that can provide a comfortable effect and stimulate the brain to immediately rest. Avoid sounds from television or radio, noise from electronic devices can keep your baby awake. Hugs from Mom can also be one of the things that will help your child to sleep more. Babies have a hard time sleeping at night due to too much sleep during the day. Because your child's nap time must be regulated and restricted. The child's nap is enough for 1-2 hours, taking a nap that is too long will keep him awake at night because he does not feel sleepy. One way to prevent babies from sleeping too much during the day is to invite them to play and chat. Making your baby's stomach feel full is one of the most effective ways to make a child sleep better at night. Give breast milk before he sleeps. If the baby is over 6 months, give food 1-2 hours before going to bed. When your child feels full, they will be able to sleep more comfortably. Flatulence until colic can be one of the causes of difficulty sleeping. The amount of gas that is held around the abdomen can cause the baby to feel uncomfortable. As a result, the baby can cry suddenly at certain times in a prolonged manner. To reduce discomfort in the stomach, you can apply talon oil to warm the baby's stomach while doing an "I LOVE U" message to overcome flatulence and re-digest the digestion of the little one. Baby massage is also effective for making babies sleep better because the baby's body feels more relaxed. It should be noted also for parents, little fussy can be a marker code of the condition not feeling well. Check the baby's body temperature if fuss does not subside, maybe he has a fever, his nose is blocked so it is difficult to breathe.